He added that a mortar shell launched by “an unidentified armed group” also hit a WFP warehouse in Hudaydah city, holding enough food to assist 19,200 in need. According to WFP, the security situation in Hudaydah is “deteriorating rapidly” and threatens humanitarian assistance to the city and surrounding areas, where food supplies are critically low. In another incident at the end of last month, a WFP truck was hit by shellfire while carrying out a delivery to Al Tuhayta, in southern Hudaydah. The truck, clearly marked with a WFP banner, was carrying around 30 tons of food assistance, enough for nearly 2,000 people for one month. It was hit by an unidentified armed group two kilometres from its final destination, seriously injuring the driver. 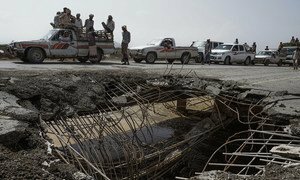 The continuing violence is part of an offensive launched on Hudaydah in June by coalition forces supporting the internationally recognized Government of President Abd Rabbuh Mansur Hadi. It marks the latest escalation in more than three years of conflict between Government forces and the Houthi opposition, which controls the Red Sea port and the capital, Sana’a. Hudaydah port is critical to the humanitarian effort in Yemen, the UN insists, because it is a primary gateway for food, fuel and medicine into the impoverished country, which imports nearly all of its daily needs. Despite the deteriorating security situation, WFP’s operations are ongoing, Mr Verhoosel said, “and we will do everything we can to ensure our operations continue throughout the region without interruption”. He explained that in August “and despite high levels of conflict in southern Hudaydah, we provided emergency food assistance to around 700,000 people, out of 900,000 people in the governorate considered to be at highest risk”. Throughout Yemen, around eight million people are close to famine “and we cannot afford any activities that would disrupt our operations aiming to provide food and nutrition”, the UN spokesperson said. He also reminded the warring sides that humanitarian workers should not be targeted and that the UN agency would “hold parties accountable” for any attacks on its facilities. “We condemn any attempt by any side of the conflict to use humanitarian aid and facilities as a tool in this violent conflict and appeal to all parties to the conflict to let aid workers do their work,” he said. “WFP warehouses, trucks, facilities, silos and most importantly staff are neutral and should not be used by any party to the conflict or targeted by any party to the conflict." “The situation has deteriorated dramatically in the past few days. Families are absolutely terrified by the bombardment, shelling and airstrikes,” she added. 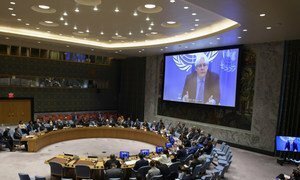 United Nations Special Envoy Martin Griffith told the Security Council on Tuesday that he never expected an easy mission when he convened Intra-Yemeni Consultations in Geneva last week, for which the Houthis delegation failed to show up.